Minnesota Governor Tim Pawlenty rallied with about 500 Iowa Republicans tonight. Pawlenty served as keynote speaker for a $25-per person Iowa Republican Party fundraiser held in Des Moines. The governor’s 24-minute speech was peppered with references to Midwestern life and an explanation for his record on the opening day of deer hunting season in Minnesota. Pawlenty aimed some of his rhetorical fire at President Obama, recasting an Obama campaign chant for Republicans. “Instead of asking you: ‘Are you fired up and ready to go?’ I want to ask you: ‘Are you fired up and ready to fight back? '” Pawlenty said, to cheers. 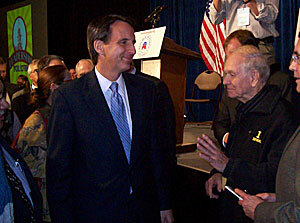 Pawlenty told the crowd last Tuesday’s election results signaled a “comeback” for the Republican Party. Pawlenty, though, stopped short of discussing his own plans for the future — and the possibility of a presidential campaign of his own in 2012. Reporters pressed Pawlenty after his speech, but the governor again said his focus was on the 2010 elections. Pawlenty’s visit got Iowans talking about his prospects as a presidential contender, though. Bill Schickel, a former state legislator, is also the former mayor of Mason City, Iowa. Schickel believes many in the crowd this evening saw Pawlenty for the first time. During his speech Pawlenty outlined some of the steps he’s taken as governor of Minnesota, like his veto record, and he joked about his “red-hot, smokin’ wife” and the two Northwest pilots taking the term “fly-over country” a bit too seriously. “My goodness, unless you’re a Guantanamo detainee, they can’t even get us, in a reasonable time, the vaccine for the H1N1 virus. How are they going to manage our health care?” Pawlenty said, to applause from the crowd. Pawlenty drew even more applause from the crowd with this punchline to his critique of the growth in the national debt: “The only thing growing faster than the federal debt is Chris Matthews’ man-crush on Barack Obama.” Matthews is host of the cable TV program, “Hardball” on MSNBC. Plenty of national media as well as reporters from Pawlenty’s homestate of Minnesota made the trip to Iowa to watch Pawlenty’s speech. Pawlenty isn’t the only potential 2012 G.O.P. candidate in Iowa this weekend, however. Former Arkansas Governor Mike Huckabee, winner of the 2008 Iowa Caucuses, will be in Iowa Sunday, making stops in three cities to sign copies of his new book.